Nobody has ever seen a monkey with arms. I was at the zoo and I saw an ape /primate (not a gorilla) getting potty trained in the public restroom. This made me realize something: monkeys arms are one of the rarest things to discover. This is because like bears, they actually have four feet and four legs and four limbs. I love howler monkeys and monkeys in captivity and also in the wild. Monkeys do the dishes without arms– now tell that to your housemaid. 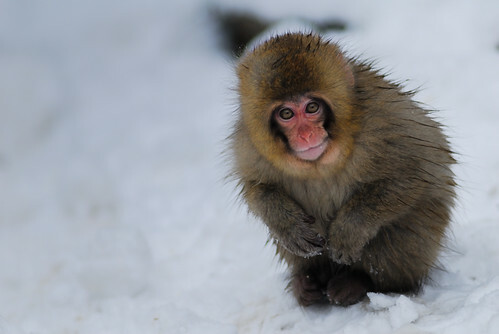 Even cute Snow Monkeys have legs growing out of their shoulders. It’s a worldwide phenomenon. This entry was posted in offbeat, opinions, smiles on August 18, 2010 by myrah. The artistic movement “futurism” is past tense. I was thinking of this painting (can’t remember artist or title) of a (wheel?) in motion. There are things not seen with the naked eye but with photography and film we’ve been able to “slow things down” (not literally of course). There was something I thought of about the reasoning of the people that want to believe in flying rods that is similar to the ideals of futurism. Perhaps both parties (the flying rodders and the futurists) are nostalgic for the future? This entry was posted in life, offbeat, opinions and tagged camera, flying rods, futurism, futurists, naked eye, photography, theory on November 8, 2008 by myrah.